Premium, marine polish creates a shiny, long-lasting, low-drag surface that repels dirt and stains. Simply wipe on and wipe off for an ultra-slick UV-protected finish that's easy to keep clean. PTFE (polytetrafluoroethylene) component creates a non-stick surface that may reduce staining and marine fouling growth below the waterline. 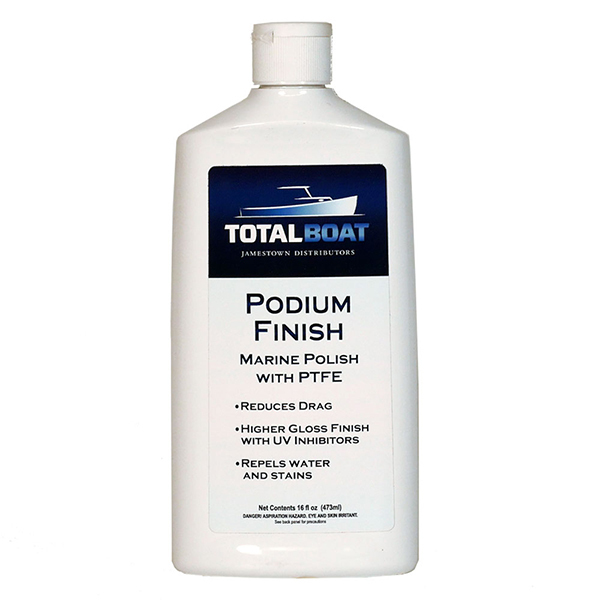 However, Podium Finish is not intended for use as an antifouling coating. Podium Finish is easy to apply and takes only a few minutes to form a haze that’s easy to remove and polish to an ultra-high shine. You’ll spend less time polishing so you can put more time in on the water. While we can’t guarantee a podium finish if you use it on your hull (It’s up to you not to blow a tack), we can guarantee that racing or not, you’ll look good getting where you’re going, and the reduced drag will get you there faster. Substrates: Fiberglass, gelcoat, and painted surfaces. Can be applied over previously applied conventional wax. Maintenance applications: For superior drag reduction, shine, and protection, apply a maintenance coat every 2-3 months. For optimal performance for boats that use Podium Finish below the waterline and are dry sailed or hauled regularly, we recommend reapplying every 2-3 weeks.